Harapan, an 8-year-old male Sumatran rhino, eats leaves inside a cage at Way Kambas National Park on Sumatra island, Indonesia, Nov 5, 2015. A U.S.-born Sumatran rhino ate leaves and wallowed in mud at an Indonesian sanctuary Thursday as the U.S. formally handed over the animal in hopes he will sire offspring and help save his critically endangered species from extinction. The 8-year-old rhino is now in quarantine at Way Kambas National Park after traveling more than 10,000 miles (16,000 kilometers) from a zoo in Cincinnati, Ohio, to the Indonesian capital, Jakarta. U.S. consular official Robert Ewing delivered the 1,800-pound (816-kilogram) rhino to Tachrir Fathoni, director general for Conservation of Natural Resources and Ecosystem at Indonesia's Ministry of Environment and Forestry, in a ceremony at the Sumatran Rhino Sanctuary in the park in Lampung province. "Thank you so much for the warm kindness [of the American people] for allowing the return of the one and only [Sumatran] rhino in the U.S.,'' Fathoni said. Ewing noted the importance of Indonesia's biodiversity and the environment, not just to Indonesians but to the world. An estimated 100 Sumatran rhinos, also known as the "hairy rhino,'' remain in the world, and nine are in captivity. The 250-acre sanctuary has five rhinos in an intensive research-and-breeding program aimed at increasing the wild rhino population on Sumatra island. Harapan is one of an estimated 100 Sumatran rhinos, also known as the "hairy rhino,'' left in the world, and nine are in captivity. Harapan, or "hope'' in Indonesia, lived at the Cincinnati Zoo and for a time was the only Sumatran rhino in the Western Hemisphere. It is hoped that Harapan can mate with one or more of the three females at Way Kambas. One of them, Ratu, a 12-year-old born in the wild, is pregnant with a calf expected in May. Her first calf, a male named Andatu born in 2012, was the first Sumatran rhino born in an Asian breeding facility in more than 140 years. The father of both of Ratu's calves is Harapan's brother, Andalas, who was returned to Indonesia in 2007. Their sister, Suci, died from illness last year at the Cincinnati Zoo. Indonesia said it does not want to be dependent on other countries in conservation efforts by sending rhinos to be bred abroad. 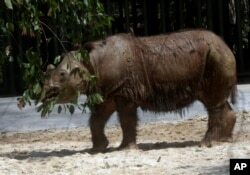 However, it says it welcomes any technological or scientific assistance for the Sumatran rhino breeding program. The Sumatran rhino is seriously threatened, with the species' numbers in Indonesia over the past 50 years decimated by rampant poaching for horns used in traditional Chinese medicines and destruction of forests by farmers, illegal loggers and palm oil plantation companies.